Much talk has been generated by Ted Cruz winning the Republican nomination for US Senator in Texas. 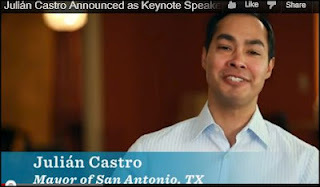 At the same time, Mayor Julian Castro of San Antonio has received much attention due to the fact that Obama chose him to be the keynote speaker at the Democrat Convention in September. The media is having a field day comparing these two Texas ‘Hispanic’ men as equal ‘rising stars’. Let’s make this perfectly clear. For starters, Ted Cruz is a Cuban American and Julian Castro is a Mexican American. The word ‘Hispanic’ is a government-made word used to lump all the Spanish speaking people under one category for their agenda. Consequently, this only furthers the confusion of the American Anglo population. In the ‘real’ world, distinction is made by those that actually speak Spanish. Using the word ‘Hispanic’ includes many Spanish speaking Americans, Mexican, Cuban, Spanish, Colombian, Venezuelan and others. Over 50% of Spanish speaking people still use their family country of origin to identify themselves and do not accept the word ‘Hispanic’. As far as I am concerned, we should not live in a hyphenated America. As Texans and as Americans, we must not confuse the reality of the American ‘Hispanic’. ‘Hispanics’ continue to grow in number, and we must accept the fact that we all strive for the American Dream. And that more and more ‘Hispanics’ are rising to the top. This leaves us to ponder the fact that these ‘Hispanics’ are voters or will vote one day, and it is up to us to welcome the ‘Hispanics’ to the Republican Party. Ted Cruz is a social and fiscal conservative. He has fought to make sure that Texans keep these ideals. Some of the principles that Cruz has stood for are preserving the words ‘under God’ in our Pledge of Allegiance, defending Life, and believing that marriage is between a man and a woman and in our 2nd Amendment, the right to bear arms. If you listen to Cruz being interviewed by Chris Wallace, you will understand why he is such a ‘hero’ to the Texas conservative. He proudly acknowledges that Faith, Family and Patriotism are important to the ‘Hispanic’ community. And he strongly believes that all Republicans will rally around Mitt Romney to defeat Obama in November. Julian Castro is absolutely nothing like Ted Cruz, not even close. On the contrary, he is the total opposite of a conservative. Castro is co-chairman of the Obama campaign, and it is my guess that Castro’s political ambition is stronger than his principles as most ‘Hispanics’ do value family and all its traditions. 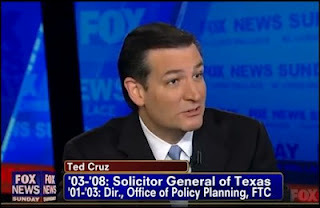 He does not represent the conservative Mexican American in Texas. And as Cruz points out, the ‘Hispanics’ outnumber other ethnic groups in our military, so they are high on patriotism. Castro is a mini me of Obama. Listen to his totally nauseating rhetoric. In the video, Castro claims that Obama brought the economy back from the ‘brink’ and ‘rescued’ the auto industry. He is promoting the reelection of the American destroyer and anti First Amendment Rights, Barack Hussein. The citizens of San Antonio may very well be on a ‘false high’ right now, but if they listen to Castro, he will lead them right into fiscal ruin and on a path to hell. Let’s NOT confuse Ted Cruz the conservative with Julian Castro the Socialist.